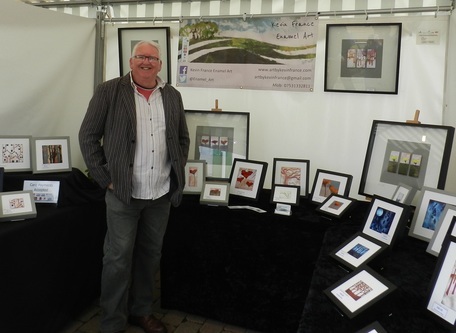 I am a designer maker based on the Shropshire, Welsh border just by the Llangollen canal in the village of Bettisfield. Having worked in dentistry for almost forty years, what was once a hobby has now developed into a small business. I tend to work along themes; however each piece stands on its own merits. The enamel panels are inspired by wild windswept places, skylines, silhouettes, reflections and the Great British weather, in fact anything and everything that catches my eye. ​Much of my work does not follow a direct path from beginning to end. Many of the themes I embrace in the enamels are constantly revisited, reworking them and edging the ideas on. Enamelling as a media is so wonderful yet frustrating you never know the out come of a piece of work until it fully cools, the fusion of the enamel to the metal and the tensions within, that heating to 800 degrees means ideas may be reproduced, but they will never be the same as the piece before due to the variables of enamel powder, furnace temperature and the metal used. This makes for very interesting results each time, always keeping me fascinated, thus creating totally original pieces of art. These enamel panels will not fade, retain their rich colour and are durable.